Getting actionable customer data is key to providing value to your client base and or users, however it can be difficult to get the most of this data and gain those deep insights, especially on a time limit. - and Visualise to produce valuable insights for your customers. In this presentation Alteryx and EasyJet demonstrate the realities of getting data out of a plane and how they use these journeys across 750 routes carrying over 66 million passengers a year, to influence their flight safety and efficiency. In this presentation Andy Cooper shows you an overview of Alteryx and provides real world insights with David Thorpe of ASDA and how they were able to unlock their data. In this presentation Andy Cooper takes you through the basics of Alteryx and Tableau and introduces you to the core elements of the platforms and what you can achieve. Join executives from Alteryx, Tableau and Cloudera as they make their bold predictions for 2016 about data blending, advanced analytics, visualization, and storage. Discover the analytics skills that will be in highest demand, new technologies to watch for (and how organizations can adopt them), and best practices for creating a data-driven, analytics-led culture. In this webinar, hear Keith Conley, Director, Analytics & Insight at Bunchball, discuss the 5 secrets of how they combine loyalty and engagement data with client, sales and attribute data to show the impact they are having on client ROI. Microsoft Excel is great for analysis, but is limited in its ability to combine vast amounts of data from many different sources. Analysts have to remember and repeat each data cleansing and data blending step every time the data changes - wasting time and adding the potential for error. See how Alteryx eliminates time-consuming, manual tasks so you can focus on getting the answers you need to impact your business. 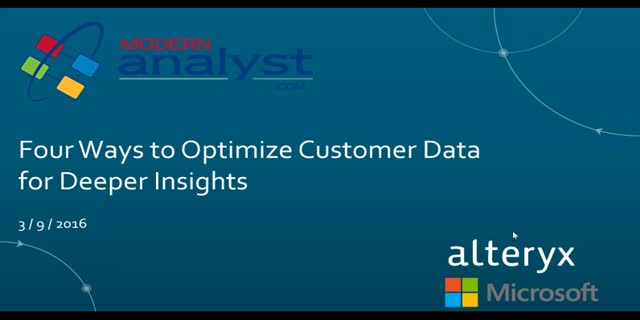 Watch this on-demand webinar and learn how Alteryx and Microsoft Power BI can help accelerate data blending and advanced analytics consumption for everyone in your organization. Hear from Julian Dell, IT Director at Amaysim and Adrian Loong BI Manager at Amaysim, on how they are using Alteryx and Tableau on Amazon Redshift to enable data analysts to spin up new self-service analytics instances to enable fast investigation for critical business decisions.